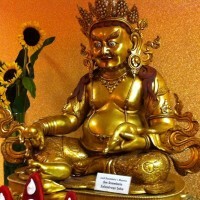 Historically, Dzambala was a student of the historical Shakyamuni Buddha. The Buddha had a cousin by the name of Devadatta, who was jealous of him and plotted to kill him. In one attempt, Devadatta pushed down large boulders from the top of a cliff to the Buddha and his students who were walking down hill. Dzambala ran forward to protect the Buddha from the falling boulders and stopped them with his body. He incurred a head injury in the process.